The lack of a need for medical intervention leads to the potential for housing those in recovery in a residential setting, which should be less expensive and more comfortable than recovery in a clinical or "institutional" setting. Likewise, the number of hospital beds in California to handle inpatient addiction treatment is limited when compared with the demand. - what the plan of treatment would be. Note that it is a conflict of interest for an Intake Coordinator associated with a Treatment Center to decide the Addict would be better served elsewhere. In Detox, the earliest stage of Recovery, the addict is either weaned off the addicting substances (by being provided with substitutes) or simply stops using them and consequently suffers symptoms of serious illness. In California, houses providing Detox services are supposed to be state licensed and have no more than 6 tenants, unless they have obtained a Conditional Use Permit from the city where they reside. Residential care services include checking regularly on the Recovering Addict while they are asleep, and staff, who do not have to have para-medical training, are supposed to be on site around the clock. This phase typically lasts 1-3 weeks before the Recovering Addict is moved to a house with a lower level of supervision, which would be more profitable for the business. After Detox or if Detox isn’t needed, the Recovering Addict may commit to an intense level of “out-patient” treatment, nearly daily therapies, under a contract. The Residential Recovery phase typically involves all-waking-hours supervision to prevent relapse, which is one reason why it is not done from the person’s own home. Offsite treatment and residential living may be mixed together contractually. In some Residential Recovery, the Recovering Addict is under 24 x 7 supervision: their daily schedule is planned by the Treatment Center; they are transported to activities in a van; their meals are arranged by someone else; there is someone supervising them when they are in the residence; they have limited access to communicating with the outside world. In other forms of Residential Recovery, the Recovering Addict lives in a house that is referred to as a "Sober Living Home" and has less supervision/monitoring, but they are similarly dependent on various services offered by the landlord or the Treatment Center, including transportation. These services come at a steep price, as much as $3000+ per day per person. In some state-licensed houses, the Recovering Addict receives therapy on the premises and may or may not have the ability to come and go according to house rules. Because of the typically high cost of supervision and services provided, this stage of recovery typically lasts 30-90 days before the Recovering Addict moves to another type of residence. A Recovering Addict COULD also skip out-patient treatment and move straight to a third phase: Independent Sober Living in a home without supervision, where the goal is reintegration with society and finding a job. 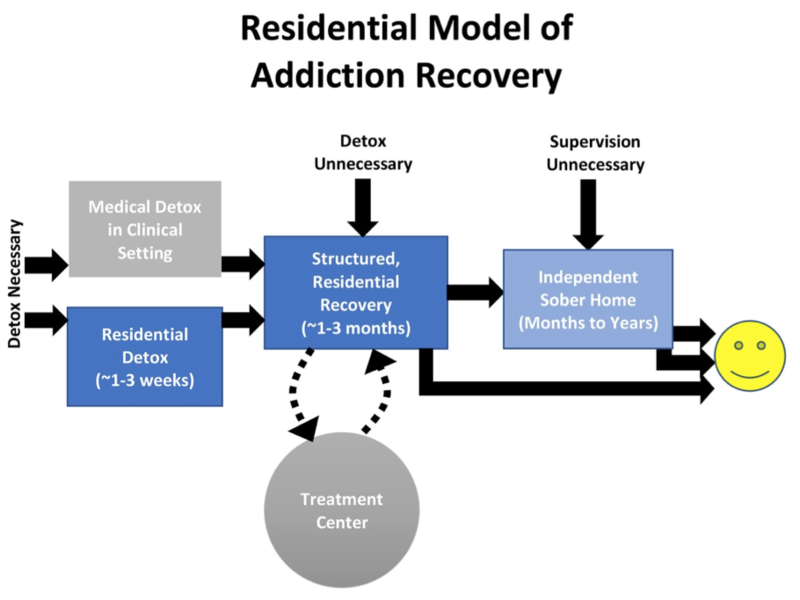 In this model, the Recovering Addict has reached a maintenance level of recovery. They agree to a set of "house rules" as part of their tenancy agreement. They might attend AA, for example, which does not require a contract. One of the most important understandings you need to have about Residential Recovery is that is fundamentally different than Independent Sober Living. In Residential Recovery, the Recovering Addict is more vulnerable to relapse and victimization due to their weakened health.